We do everything, not too big , not too small ! Lead base paint remove! Sagni's handyman ! Want to connect with Bruno? 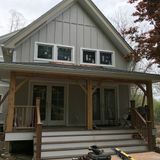 General carpentry, framing,sheeet rock,taping,paint,trim,doors,Windows,wood floors, tile, cabinets, and much more , certificate lead Paint remover , license and insurance and westchester count y and connecticut!!!!! !